Basically if you want to know the future, read this. 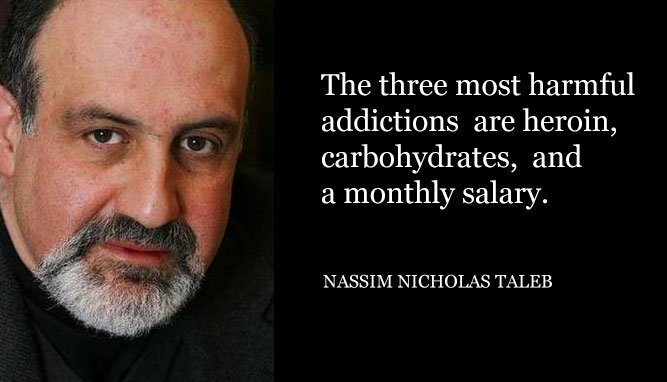 Supplement it with “Abundance” by the same two and “Tomorrowland” by Steven Kotler” and even “The Rational Optimist” by Matt Ridley. I feel “Abundance” is like a sequel to “The Rational Optimist”. So I’m giving you four books with one recommendation. Gladwell is not the first person to come up with the 10,000 hour rule. Nor is he the first person to document what it takes to become the best in the world at something. But his stories are so great as he explains these deep concepts. How did the Beatles become the best? Why are professional hockey players born in January, February and March? And so on. Also add to this: “How We Got to Now” by Steven Johnson. Basically: don’t believe the myth of the lonely genius. Ideas come from a confluence of history, “the adjacent possible” specific geographic locations, etc. The connections Johnson makes are brilliant. For instance, The Gutenberg Press (which, in itself, was invented because of improvements in sewing looms), made everyone realize they had bad vision. So the science of lenses was created. So microscopes were eventually created. So germs were eventually discovered. So modern medical science was discovered. And so on. Johnson is a thinker and a linker and tells a good story. I’m at a loss for words here. Just read it. Don’t read it for the Holocaust. Or psychological theory. Read it because when you’re about halfway through you will realize your life is no longer the same. And next time you get a chance to whisper in the ear of someone about to kill himself, whisper words from this book. And while you are at it, throw in “Bounce” by Mathew Syed, who was the UK Ping Pong champion when he was younger. I love any book where someone took their passion, documented it, and shared it with us. That’s when you can see the subleties, the hard work, the luck, the talent, the skill, all come together to form a champion. Heck, throw in, “An Astronaut’s Guide to Earth” by Commander Chris Hadfield. There’s a lot of business books out there. 99% of them are BS. Read this one. So many concepts really changed my attitude about not only business but capitalism. Thiel, the founder of PayPal, and first investor in Facebook, is brilliant in how he simply shares his theories on building a billion dollar business. I love his story on my podcast what exactly happened in the room when a 24 year old Mark Zuckerberg was offered $250,000,000 and refused it in two minutes. Probably half the world is introverts. Maybe more. It’s not an easy life to live. I sometimes have that feeling in a room full of people, “uh-oh. I just shut down. I can’t talk anymore and there’s a lock on my mouth and this crowd threw away the key.” Do you ever get that feeling? Please? I hope you do. Let’s try to lock eyes at the party. “Quiet” shows the reader how to unlock the secret powers that probably half the world needs to unlock. And, please Susan Cain come on my podcast. And throw in “The Black Swan” and “Fooled by Randomness”. “Fragile” means if you hit something might break. “Resilient” means if you hit something, it will stay the same. On my podcast Nassim discusses “Antifragility” – building a system, even on that works for you on a personal level, where you if you harm your self in some way it becomes stronger. That podcast changed my life. He discusses Antifragility throughout history, up to our current economic situation, and even in our personal situations. Again, I am fascinated by the field of mastery. Not self-improvement (eat well, sleep well, etc) but on how can you continue a path of improvement so that you can really enjoy the subtleties at a very deep level of whatever it is you love. Carol Dweck, through massive research and storytelling, shows the reader how to continue on the path of improvement and why so many people fall off that path. In case you’re one of the few folks out there that’s never heard of James Altucher, let me briefly introduce you. According to Wikipedia, James Altucher is an American hedge fund manager, entrepreneur, bestselling author, and podcaster. He has founded or co-founded over 20 companies, including Reset Inc. and StockPickr and claims to have failed at 17 of them. He has published 11 books, and is a frequent contributor to publications including the Financial Times, TheStreet.com, TechCrunch, Seeking Alpha, Thought Catalog, and the Huffington Post. USA Today named his book, “Choose Yourself” among the 12 Best Business Books of All Time, therefore another title to add to the Important Book list. This entry was posted in Blacksmith Books and tagged Carol Dweck, James Altucher, Malcolm Gladwell, Nasim Taleb, Peter Diamondis, Peter Thiel, Robert Greene, Steve Martin, Steven Johnson, Steven Kotler, Susan Cain, Victor Frankl. Bookmark the permalink.